deStijl Relationship with stained glass at GOMA (Gallery of Modern Art) in Glasgow Scotland on April 4, 2010. 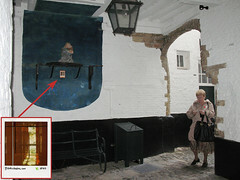 LEFT: This picture was left in the "Vlaeykensgang" alleway in Antwerp, Belgium on 8/28/2010. FOUND! - This picture was found on 9/6/2010, 9 days after it was left, by a great Belgian photographer shooting in the area. 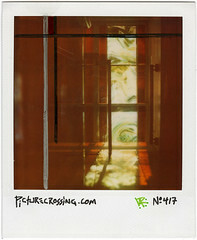 "Just found the Polaroid you had left at the 'Vlaeykensgang' in Antwerp! It'll look great on my wall! - Cheers, Jesse (www.jessewillems.be)"